An undeniable fact when looking at EU-China rail services is that goods need to be transported via Russia. This is not always the easiest of situations, and especially so for EU based businesses. The sanctions have slowed down much needed EU-Russian infrastructure development and integration and customs clearance, while occasional petty theft or bribery can also be a problem. However, there is no reason to miss a Russian transit once one understands the longer term issues and how to deal with them. Concerning logistics, this business is currently heavily politicized in Russia. Due to the on-going EU sanctions, Russia’s policy is that no railway company will be given railway development plans for or to be directed to or from the EU by rail. 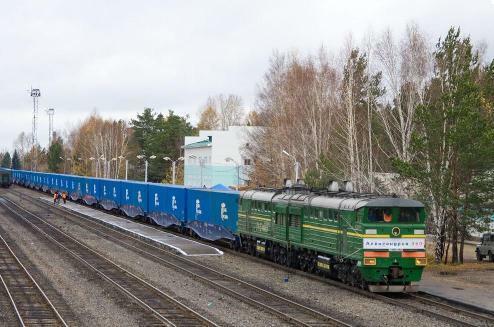 That means that the services and capacity provided in Russia is frozen in time at 2014, a period during which China overland freight has begun to develop. The biggest decline in EU-Russian rail freight was in 2015 after the imposition of sanctions, when volumes fell by one fifth. The volume of container terminals in Russia dropped by nearly two times, compared with a slight decrease in Europe. However, slowly, things are starting to return in terms of trade, even though rail infrastructure development between Russia and the EU has come to a complete halt. Last year, volumes increased by 3 percent. At the beginning of 2017, Russia-EU rail freight grew by about 20 percent compared with 2016. However, this is still playing catch up with previous levels. There are potential bottlenecks when the China transiting freight really starts to pick up as EU-Russian development and integration has stopped. Nevertheless, at present, only two issues really affect EU businesses when it comes to Russian Rail: Western and Russian sanctions policies and the embargo on Russian railways imposed on certain EU nations. In fact, there are no obstacles on the Russian Railways when receiving transport plans for container trains. However, this more open policy is starting to be expanded, and it is envisaged that by 2020, Russian Railways will not request transportation plans from EU based logistics companies at all. Currently, this means that there is no reason to change the modes of rail freight while the sanctions remain in place. The situation is largely static. However, should the EU-Russia political situation change, then this will free up investment and trade demand, and the flow of EU-Russian goods will begin to flow again. The current round of EU sanctions expire in January 2018. Meanwhile, despite the sanctions, Russia’s ports are very well developed and, for example, capacity at container terminals in Northern Russia exceed by 100 percent – the current demand for service. Russia has been keeping pace with the expected development of pan-Eurasian trade, and has been upgrading and expanding these facilities, often with Chinese and Japanese financing. EU’s border ports with Russia meanwhile are still on the radar for Russia’s transit carriers, and this has always been the case. Kazakh goods such as sugar for example, move frequently through EU nations via Russian Rail. Japanese auto investment has seen the Russian town of Kaluga, just south of Moscow, start to develop into a bespoke rail hub, with the Mitsubishi plant there receiving a consistent supply of auto component parts from the EU for the past five years. Kaluga has long been a rail hub, albeit with an interesting history of ups and downs, yet Mitsubishi’s choice of factory location shows a huge amount of forethought and planning beyond the standard auto-manufacturing mind set. Pictured above is one of the trains leaving Kaluga, full of Mitsubishi auto components. Kaluga is directly connected to Moscow, and is an example of foreign investment siting itself deliberately on a rail network to take advantage of existing infrastructure that can be developed in accordance with Mitsubishi’s specific needs. Such concepts may start to catch on, as the recent Russian policy of relocating Rail and Logistics Hubs from Central Moscow and St.Petersburg to the outlying areas suggests. In this instance, the imposition of sanctions allows Russia some breathing space in terms of capacity and volume as the rail terminal is currently being removed from Moscow. However, another set of bottleneck problems arrives in that it is currently more difficult for Russia and the Government to access cheap money for infrastructure investment due to the sanctions, and the larger infrastructure projects are frozen. The ordering of rail terminals out of Moscow and St.Petersburg has been granted, but there are no new places to go. While this dual situation continues, it means that some of the facilities outside Moscow and St. Petersburg city limits are overloaded, and items are loaded onto trucks and transported by road instead. This hurts European consumers, as the costs and delays of this are passed onto them, and it also impacts upon the Chinese, who do not like this situation where, after a fast train across Eurasia, there are problems with goods at the Moscow railway station. There is some light at the end of the tunnel, however, in that while the St. Petersburg railway node is overloaded, the huge Koidula border station in Pskov is largely empty. There are development issues in Koidula, and when this facility comes online it will ease some of the re-location issues currently being undertaken by Russian Rail. It should also be noted that Russian Rail does pay attention to EU nation’s investment as concerns logistics, and will respond with talks and development plans to react to these and take them into account. One example of this is Russian Rails plans to extend services from St. Petersburg through to Berlin via Latvia, Lithuania, Kaliningrad, and Poland. Talks have apparently been progressing “positively”. The Kaluga example meanwhile may point the way forward for larger manufacturers with an eye for the potential development of a bespoke rail yard for later commercial purposes. Part of Kaluga is almost exclusively utilized for the Mitsubishi assembly plant, rather than for any other commercial concerns, although that could start to change. Russian forwarders are, of course, trying to bring Mitsubishi components to the Sea Port Ust-Lugo, and are pitching that as a service hub. Since Mitsubishi have been working in Russia for a long time, they are aware of the problems that may occur in Russian ports, such as spot inspections and other administrative delays. Instead, in Kaluga, Mitsubishi are operating directly from the wheels, which means that the goods are lifted straight to the rail and they are moved immediately from the factory. Developing and using a bespoke rail service aligned with a manufacturing plant makes a lot of sense. At Kaluga, the Japanese understand very well that at a port in Russia, at any one time a customs officer may appear with some unprecedented conditions or interpretations and send containers for inspection. Such factors are arbitrary, no-one can be sure how long the review can take. For example, the Port may process the container in three days, while the customs, in turn, control the goods for a week and this takes up delivery times. This also impacts upon the customer, as they pay for it. But in an in-house automated system, the automated system operates, the containers are well identified and under the manufacturer’s control, the client knows about the movement of his container in real time and the goods are shipped without delay. Understanding the current limitations and development issues when it comes to dealing with Russian Rail logistics is not the simplest of tasks given the current political situation. However, Mitsubishi have shown an imaginative solution that crucially, also fits in with Russia’s policy of de-centralizing rail freight hubs away from the city centers. Identifying potential manufacturing plant sites in close proximity to major rail networks makes a lot of sense, and especially as Russia also wishes to develop its own engineering employment and encourage such industries and employment opportunities. Russian Rail appear open to discuss development spurs to bespoke factories in a nation that will become, over time, a new consumer market on its own. The latent Chinese export demand influence that Russian manufacturing is sure to be exporting to, means it makes sense to be looking at underused or even defunct Russian rail spurs with connections to main lines into Moscow, St. Petersburg, the other major Russian cities, and of course the routes through to the EU and China.